Thrishna Cuisine is a culinary style originating in Bengal where the preperation of food and cooking with spices goes back more than 5000 years. The popularity of spices created the spice trade which developed overland and by coastal routes throughout South Asia and the Middle East by about 4000 years ago. 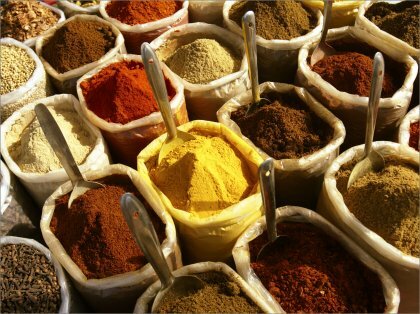 Many spices originating in different countries were soon cultivated locally where possible. Ancient records show that around 3000 years ago Queen Sheba visited King Solomon in Jerusalem and offered him 120 measures of gold, many highly prized spices, and precious stones. Bengal's coast is at the top of the Indian Ocean and historically bordered south west China, thus a key link in the early spice trade routes overland and by sea. Cultural exchange of ideas and know how is nothing new, as the ancient spice trade shows. 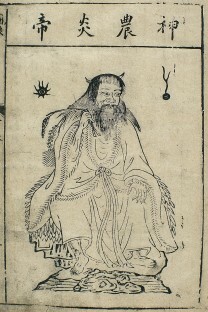 4700 years ago the Chinese Emperor Shennung (see image left) is attributed with creating the original "Pen Ts’ao Ching", which can be translated to "The Classic Herbal", a guide to medicinal herbs and spices in use at the time, including: Orange, Chinese Cinnamon, Ginger, Red Date and other spices still used in our cuisine today. Cardamom and Turmeric originating in the region are both known to have been cultivated for 4000 years. Nutmeg and Cloves arrived in Bengal from China overland having first come from Indonesia by sea no later than 2300 years ago (see Anicent Trade Routes above). Spices were initially very expensive and thus used mainly by Bengal royalty and wealthy households. Early culinary skills were developed by chefs in their kitchens with good access to the vast range of ingredients. Bengali cuisine evolved the only known refined multi-course tradition, much later copied by the French and many others who during the medieval period served in a style called "service en confusion" (all at once). 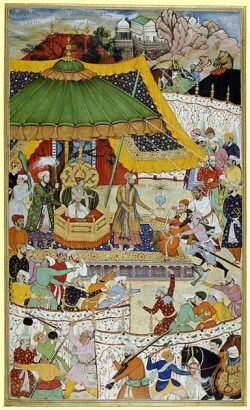 In about 1590 Bengal Emperor Akbar's court (Mughal Empire - see image on right) recorded many recipies of the time in a book called "Ain-i-Akbari", this book is still available in library archives. About 500 years ago, traders brought the now popular Chilli Peppers into the region. Tomatoes arrived at about the same time, both originated in South America. Before then, native spices including Black Pepper, Long Pepper, Ginger and Mustard were used to add a degree of hot taste. As the vast range of available spices grew over millennia, creative chefs were almost unlimited in the range of flavours and combinations they could create. Good chefs were thus highly prized, which encouraged secret recipes to evolve. This is why today, quality independent Bangladeshi restaurants rarely produce the same dishes. Thrishna's Cuisine is unique, constantly developed by good chefs in the traditional Bengali way, praticed for millennia. Many spices and other ingredients have been used for over 5000 of years for their medicinal value, not just a healthy diet. US Department of Agriculture (USDA) has shown half a teaspoonful of cumin seeds, is equal to a standard portion of red grapes antioxidant potential, a teaspoonful of dried ginger or paprika can match a portion of tomatoes or green pepper. Analysis of curry spices by Australian academics conclude that one teaspoonful is a powerful antioxidant fix similar to portions of broccoli, spinach, red peppers, carrots and other high-scoring vegetables dubbed 'superfoods'. One teaspoon of ground cinnamon or cloves packs as much antioxidant power as a portion of cranberries, blueberries or raspberries. While taking a spoonfull of spice can not provide instant cures, it is very clear that regular consupmtion of a balance of spices can help maintain health and the bodies condition, thus preventing illness and a cure some conditions. Bitter Melon: has been shown to "significantly reduced blood glucose levels among patients with type 2 diabetes". Cloves: contain antioxidants, are antiseptic and are often used to relieve toothache (clove oil). Cinnamon: is one of the most important spices used all over the world, it primarily contains vital oils and derivatives, such as cinnamaldehyde, cinnamic acid and cinnamate. It is also an antioxidant, anti-inflammatory, antidiabetic, antimicrobial, anticancer, lipid-lowering, and cardiovascular-disease-lowering compound, cinnamon has also been reported to have activities against neurological disorders, such as Parkinson's and Alzheimer's diseases. Coriander: has anti-inflammatory, antibacterial, anti-allergic and antioxidant properties. Studies show eating 20 sprigs of coriander a day for two months reduced inflammation levels in arthritis sufferers. Cumin: is rich in iron, potassium, zinc and is associated with many health benefits including antimicrobial, antibacterial, antioxidant and anti-inflammatory properties. Garlic: is antioxidant, rich in vitamins (B6, C, Manganese and Selenium), used as an antibiotic to treat bacterial, fungal and parasitic infections, known to reduce the severity of common illnesses like flu and the common cold. Ginger: can improve arthritis and rheumatism conditions, it also has anti-inflammatory and anti-oxidative properties which reduce the process of aging. In clinical trials with Migraine sufferers, a quarter teaspoon of powdered ginger was found to be as effective as the main prescription medicine Sumatriptan. Turmeric: modern science is researching the "anti cancer" effects of Turmeric. In a recent trial (2016) more than 50 per cent of patients suffering ulcerative colitis achieved remission within a month on a Tumeric extract - compared with none who received the placebo.